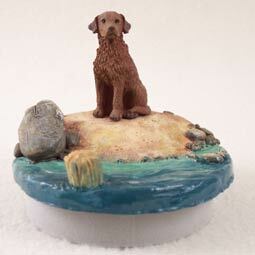 Home > Dogs All > Chesapeake Bay > Chesapeake Bay Retriever Candle Topper Tiny One "A Day on the Beach"
The Chesapeake Bay Retriever was named after the bay on the Maryland coast where an English brig shipwrecked in 1807 and two Newfoundland dogs were rescued and bred to the local retrievers. This may have included the English Otter Hound and the Flat-Coat and Curley-Coated Retriever. This breed was developed to work on the land and the water retrieving waterfowl, and had been known to retrieve hundreds of birds per day. The “Chessie” is a strong, powerful medium sized breed weighing 55 t0 80 pounds and being 21 to 26 inches tall at the withers. Their double coat is comprised of a short, harsh wavy outer coat with a dense fine wooly undercoat. While short, this coat must be brushed regularly because both coats contain oils to protect the dog from weather conditions. The coat can be brown, sedge or dead grass in color according to the AKC standards. The AKC recognized the Chesapeake Bay Retriever in the Sporting Group, in 1878.